GREEN BAY — Eddie Lacy was the star of the Packers’ running and passing games in the first quarter, and the Packers held a 7-0 lead over the Bears after one quarter of play. The Bears won the toss and deferred. The Packers received the opening kickoff and began their first possession at their 15-yard line. On the second play, Lacy broke several tackles in a 29-yard run. On fourth-and-2 from the Bears 48, Lacy carried and was stuffed. The Bears began their first drive on their 49. Green Bay regained possession at its 16-yard line. A couple of Bears penalties helped move the ball across midfield. Eventually, the Packers would face a third-and-11 from the Bears 47. Aaron Rodgers hit Davante Adams in stride on what might’ve produced a touchdown, but Adams dropped the ball. The Packers defense pitched another three-and-out and the Packers got the ball back at the Bears 49. 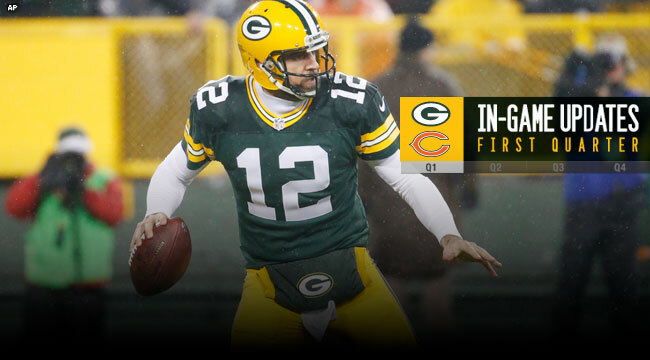 Rodgers completed a 13-yard pass to the Bears 33. The Packers scored on a 25-yard pass play to Lacy, who slipped through the line of scrimmage to catch Rodgers’ pass and run untouched to paydirt, 7-0, with 5:20 to play in the first quarter. Chicago didn’t gain a first down in three possessions, and the Packers were back in business at their 38 with 4:06 to play. The quarter ended with Chicago in possession of the ball at its 41.